Make sure your white chocolate is yellowish and not the more artificial “white”. 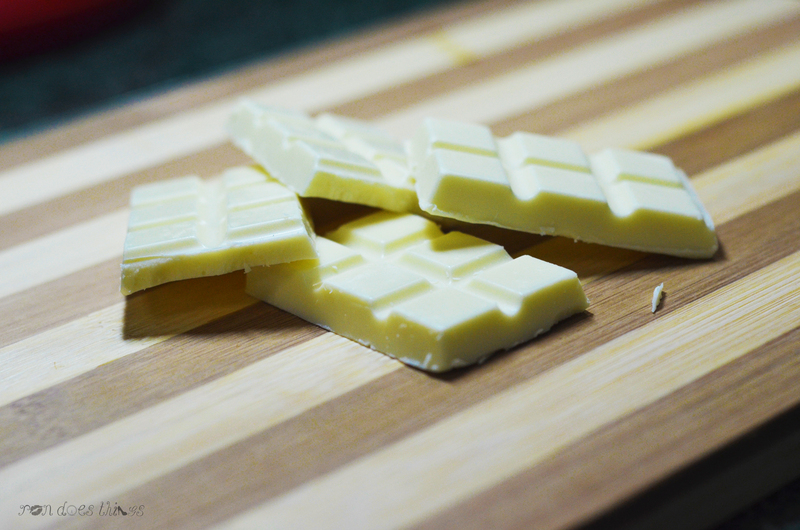 (1) Chop your white chocolate to bits. (2) Mix 10g butter with the 76g (2 bars) white chocolate. (3) It’s ideal to use a double boiler but it’s more convenient to use microwave. The heat is very important to melting as it’ll burn up or cause to “seize” and will create lumps when too much. You have to adjust the power level of your microwave to half (50) and heat the white chocolate for 30 seconds. (4) It sometimes depend on your white chocolate but with mine from a room temperature, it managed to melt completely after 30 seconds with power level 50. It may seem like it has lumps but once you “mash” it and mix it, it will completely melt given the fact that it is still warm from the microwave. If you still see lumps even after mashing, pop it in the microwave for about 10-30 seconds, still on power level 50 (or half of your max). And voila! Creamy white chocolate. Serve with fruits and marshmallows. Or if you’re serving for kids, you can make fruit skewers and drizzle them with white chocolate so it will seem more fun for kids.